EASY TO STORE - Lightweight storage folding chair without disassembling. The electric wheelchair folds up in 5 seconds and is very compact to fit in most small trunks. Has a handle under the seat for easy lifting. DURABLE AND STYLISH - Smart silver aluminum aircraft alloy frame, includes matching footrests. 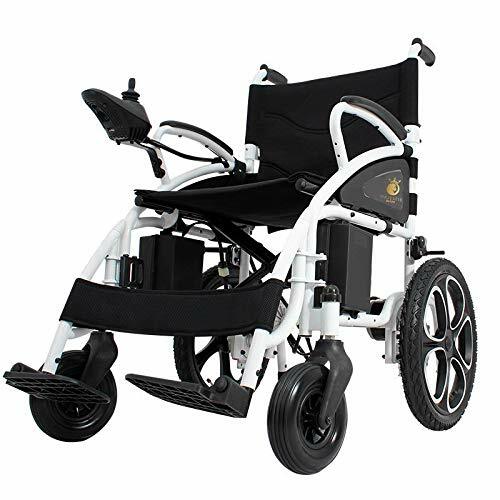 This model power wheelchair is very lightweight and durable, and requires no maintenance. COMFORT ON RUGGED TERRAIN - Ergonomically designed for comfort. 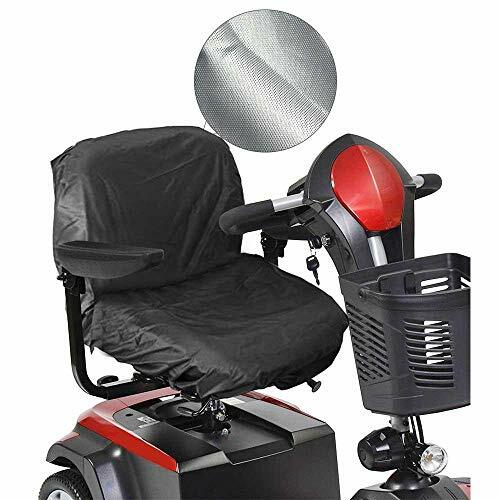 Operate this motorized wheelchair in grass, gravel, or snow, with a long lasting battery life and shock absorber for ride comfort. Has a sharp turning radius, make sharp turns easily. POWERFUL MOTORS - Equipped with two (2) 250-watt motors for a powerful ride. Also includes easy-to-detach cord on joystick to easily remove and place on the right or left side. TRAVEL EASILY - Convenient for storage and transport for folding feature and light-weight design for easy carrying. 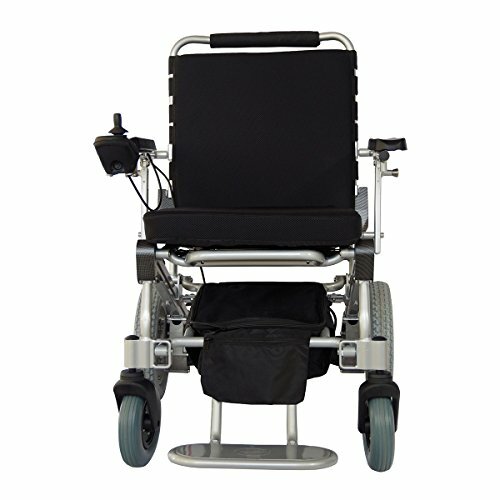 Comes with under the seat storage and this electric wheel chair has a removable seat and seat cover for easy cleaning. Single Lithium Battery for Replacement (INNUOVO Electrical Wheelchair). Excellent Details: Standard equipped with seat-belt and anti-tipper; Equipped with 2 batteries, each can go 6.25 miles with fully charged, two for 12.5miles. Overall Dimensions: 35.4*23.6*34.6'' Folded Size: 12.6*23.6*28.3" Seat Height: 19.6'' Seat Width: 18.9'' Seat Depth: 16.1'' Arm Height: 8.3'' Seatback Height: 16.5'' Wheelchair Weight: 19.8kg without battery Maximum Speed: 4.5km/h Support Upto: 295 lbs Motor Type: 24V/250W*2 Lithium Battery Type: 24V/6AH*2 Max Output Current of Controller: 35A Max Output Current of Charger: 2A Front Wheel: Solid tire, Outside size of 7'' Rear Wheel: Solid tire, Outside size of 9'' Slope Capacity:between 6 and 8 degree Enjoy the Free Mobility Now! THE SAFER CHOICE- Our electric wheelchair is FDA approved and implements a variety of safety features. 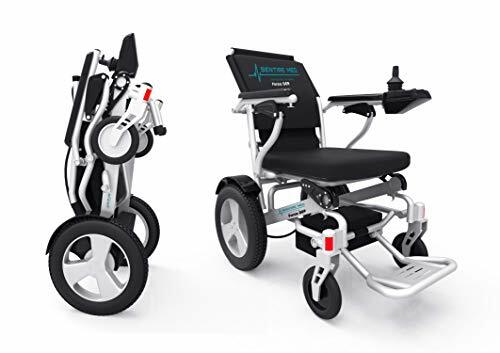 These include a 360-degree joystick, solidly stable front and rear wheels, a foldable foot rest, 2x250w motors, and extremely durable construction. SIMPLE TO OPERATE - Using an innovative joystick design and an updated electric magnetic breaking system, our wheelchair gives you superior motion control and quick stopping. It's adjustable anti-leaning rear design also keeps it perfectly stable. Also with the separate 2 high performance lithium battery design, keep left one side battery running for the chair and customers can backup 2nd batttery charged outside. LIGHTWEIGHT AND EASY TO FOLD - Being built with an aviation aluminum frame and weighing only 50lbs, our power wheelchair is durable and incredibly lightweight. It's also easy to fold in 3 seconds, making it perfect to travel with and store for later. FANSTATIC STABILITY AND COMFORT - Thanks to our power chair's unique 7.5cm thick seat cushion(with seat belt), it's extremely comfortable and prevents against seat depression and bedsores, as well as protecting the caudal, lumbar, and neck vertebra from twisting. SATISFACTION ENSURED - FBA service, Quality Ensured, Accesary replacement available. Compact Mid-Wheel Drive Power Chair, Burgundy The mid-wheel drive HS-2800 Power Chair features a patented Anti-Tip wheel design that keeps riders safely on course. Its extra-tight turning radius easily handles corners and curves with simplicity using flat free tires. Standard features include a Shark controller with joystick, a 19 mid-back seat with an adjustable headrest and seat belt, and an adjustable footplate. With the body styling that covers all suspension parts, it creates a beautiful sleek profile. - Maximum Speed: 4 mph - Capacity: 300 lbs - Strong and Responsive Anti-Tip Wheels keep you SAFELY on course. - ZERO Effort Free Wheel Lever - Swing-Away Joystick lets you pull right up to any table. For an additional fee, you may wish to take advantage of our "White Glove Service". Be sure to ask for details when placing your order. Product photo may not exactly match the product offered for sale. Please refer to the product description. Now with an Unbeatable Price. Get Yours Today and Enjoy the Free Mobility Now! 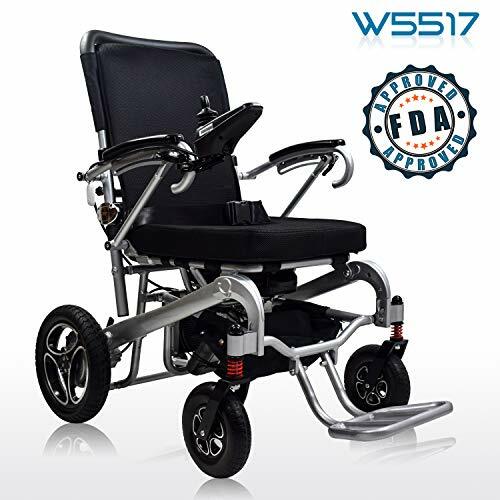 Box: 33" x 17" x 32"
Unfolded: 38" x 27" x 38"
Folded: 28" x 16" x 28"
[ FDA APPROVED ] -- Our Electric Wheelchair is FDA Approved So You will Have All Necessary and Most Safety Features Automatically. This Wheelchair is Airplane Travel Approved and Cruise Trip Ready. [ EASY TO HANDLE ] -- No Need to Disassemble. This Electric Wheelchair Easily Folds up in 5 Seconds and Fits in Most Trunks. Very Convenient for Storage and Travel. In Addition Seat and Back Rest Cushion Can be Easily Removed for Cleaning. 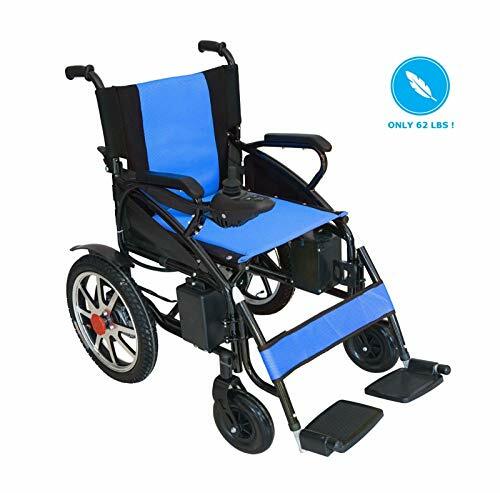 [ DURABLE AND STYLISH ] -- New Technology Aircraft Alloy Grade Carbon Steel Construction Makes This Wheelchair More Durable and Lightweight Also Does Not Need Any Maintenance. [ SMOOTH OPERATION ] -- With Ergonomically Designed 360 Waterproof Universal Intelligent Joystick This Wheelchair Gives You Smooth Operation and One Hand Free for Quick Stop. With the New Anti-Leaning Rear Design It is Perfectly Stable. [ LIFETIME WARRANTY ] -- As a US Company We are Giving Gold Standard 24x7 Customer Support for All of Our Customers. We Have No Questions Asked Return and Money Back Guarantee for 30 Days and a Wonderful Spare-Parts and Repair Warranty for Lifetime. 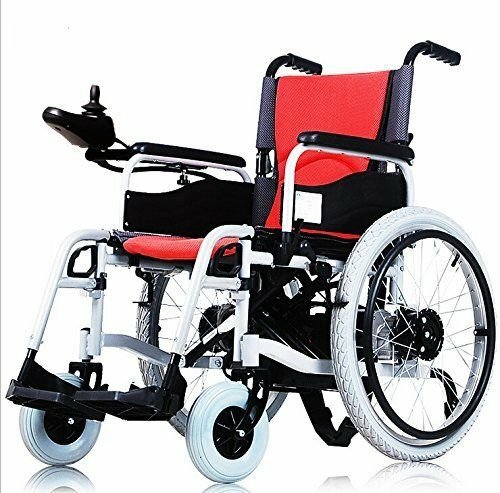 The versatile wheelchair is assembled with Aluminum Alloy Foldable chair, lithium battery, breathable seat and back cushions, and removable handrails etc., which could be a transport wheelchair when you remove the handrail. The controller can be installed on either the left or right handrail. This is the upgraded version that reduces 43.5% in weight. Lightweight and comfortable! The lightweight wheelchair either be a hand-push wheelchair or a electric wheelchair for your option against your standards. Otherwise, it has two kinds of brake system-manual and electric. Please kind note that you only use the wheelchair in manual mode when running out of power. Premium Scooter Seat Cover --- AOLVO seat covers made of high quality 210D oxford cloth, waterproof and durable, protect your mobility scooter from rain and sun. Elastic Wheelchair Seat Cover --- Elastic design allow the seat cover holds in place much better than similar seat covers. It will not slid by wind and rain. Magtic Tape Strap Design --- Two magtic tape straps are set on different sides. So this seat cover can be firmly held on your scooter seat, even can be set on the wheelchair seat which is not a flat. One Size Fits Most Seat --- Measuring 35.4 in x 18.1 in / 90 cm x 46 cm, great suitable for most motorized wheelchair and electric scooter seat. Waterproof seat cover will keep your seat cool and dry. Service Guarante --- If you are not completely satisfied with our Scooter Seat Cover just contact us , we will try our best to give you a satisfactory solution! The Drive Medical Viper is a versatile wheelchair right out of the box and it is easier to propel and transport than an average weight wheelchair. The Viper comes standard with adjustable padded arms, multiple seat to floor height positions, anti-tippers with flip-up wheels which never have to be removed and push to lock wheel locks. The back is height adjustable to provide added patient comfort. The carbon steel frame is high strength while remaining lightweight. 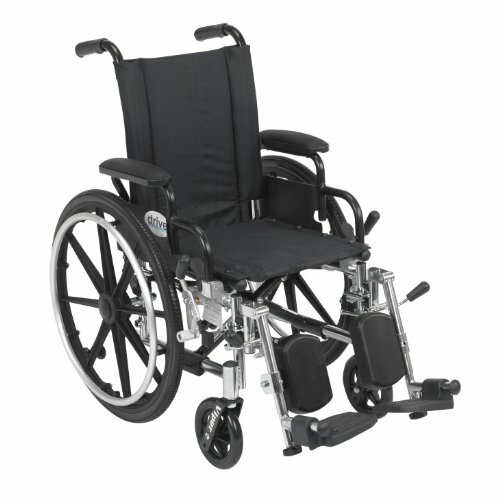 The wheelchair upholstery is made of durable nylon for long lasting comfort and cleanliness. 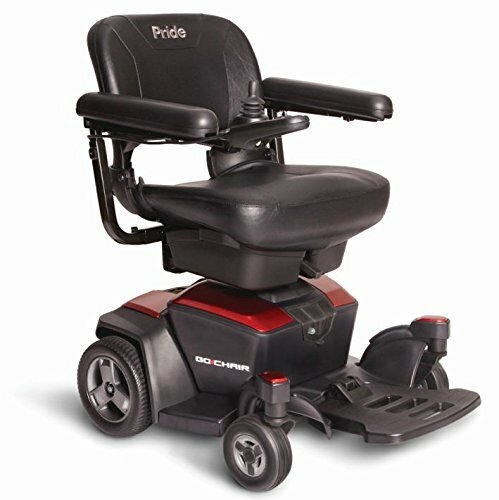 These comfort options make the Viper from Drive Medical an ideal wheelchair for anybody that needs to be in a wheelchair for extended periods of time. This wheelchair comes with flip back removable desk arms, elevating legrests, and a 14" wide seat. The Forcemech Voyager R2 is a product of Superior Craftsmanship and Design . Weighing only 43lbs without Batteries. its strengthened and enhanced metal alloy frame allows a weight capacity of 265 lbs. It comes standard with Dual 200 Watt Brushless Motors and Dual 6.6Ah Lithium Batteries for a maximum travel distance of up to 16 miles when fully charged. The new Voyager R2 incorporated Ergonomic Design for Maximum Comfort when seated, All Wheels are Built With Metal Alloy Core for further structure integrity. Shock-Absorption Springs have been added in the front for further improvement of a smooth riding experience. Rear Reflective Lights are added for extra visibility in addition to our highly visible Forcemech yellow color. The R2 is the Pinnacle of the Newest Design and the Latest Technology . 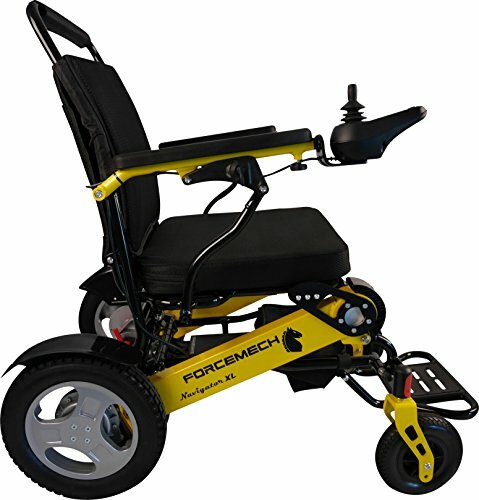 Forcemech is a US Company that is committed to offer the best Mobility Products. All Products Backed By Forcemech's Gold Standard 24x7 Customer Support! R2 weights only 43lbs - Lightest in the Industry, Foldable in Seconds. FDA Certified - Airplane Travel Approved & Cruise Trip Ready! Will give you back your mobility freedom guaranteed or your money back. The Navigator XL is the ultimate when it comes to Power and Stability. The Elephant of All Power Wheelchairs is here to answer your call. Built on the same great frame of the Navigator, at 17'' Deep and 19'' Wide, the XL version has upgraded Seating Area That is the Biggest Among Similar Products on the Market Today, it gives the user Supreme Comfort and stability support when traveling through any terrains. The Strengthened Structure gives the unit Maximum Weight Capacity at 400lbs., and it still Folds and Fits into Most Trunk Spaces with Ease. This version of Navigator has a Very Limited Quantity in stock due to manufacturing difficulties for making such beasts. If you believe this is the powerchair for you, make it yours today! Weight (without batteries): 56 lbs Weight Capacity: 400 lbs Travel Speed: 5 MPH Climbing Slope: 12 Max Travel Distance up: to 16 miles Unfolded ( L x W x H ): 38" x 27" x 37" Folded ( L x W x H ): 26" x 13" x 31" Armrest Height ( From Ground ): 28" Seat Height ( From Ground ): 19" Seat Size ( L x W ): 17" x 19" Ground Clearance: 3.7"
Front Wheel Size ( D x W ): 7" x 1.8" Rear Wheel Size ( D x W ): 12.5" x 2.3"
Super Heavy Duty Portable Wheelchair, Foldable in seconds, Air travelling approved. Fits in car trunks equal or bigger than a Honda Civic / Ford Focus / Chevy Cruze. Innuovo presents its most INNOVATIVE and ADVANCED wheelchair yet! This electric wheelchair is made to make your experience effortless. 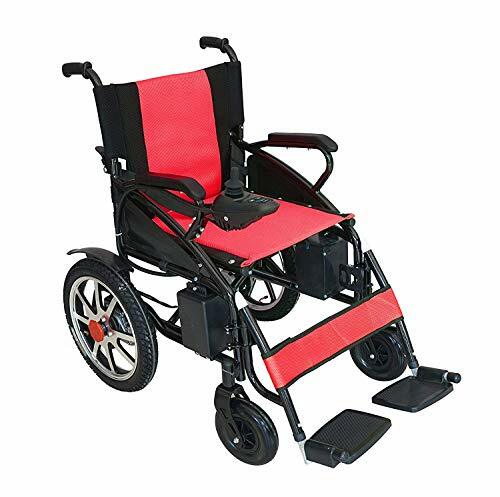 Its remote control folding mechanism will fold/unfold your wheelchair in 10-15 seconds. Press a button, and voila, your wheelchair is ready to be put away or packed in the trunk of your car, even a common-sized Sedan! The Model W5517 is designed to be very comfortable. It has a wide seat and adjustable backrest and armrests! In this wheelchair, you'll sit back and relax as you run errands, visit neighbors or just enjoy the fresh air. We are proud to offer best-in-class safety features. All its wheels are made of solid rubber, making it almost impossible to get a flat tire. Electric braking stops the wheelchair within a 3-foot range. It is also FDA certified, making it safe to travel by air with your wheelchair. Our Model W5517 has large back tires and is robust. This makes it very stable, which is why it's ideal for using both indoors and outdoors. The electric controller (joystick) can be placed on either armrest for right or left-handed people. Two batteries included. THE MOST INNOVATIVE & ADVANCED electric wheelchair available on the market. 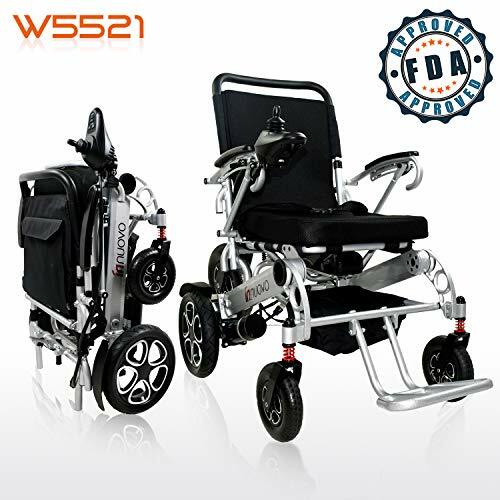 The W5517 wheelchair can be folded and unfolded with a remote control. You don't even have to touch it! AN ADJUSTABLE wheelchair that caters to your needs and comfort. Its wide seat and adjustable backrest and armrests are designed to make your life hassle-free! In addition, its big wheels and robustness make it extremely stable, keeping you safe along the way. A PORTABLE, LIGHTWEIGHT, AND CONVENIENT device that will easily fold into the trunk of a common Sedan. The entire device, including its batteries, weighs 63 lbs. Even so, its frame is so strong that it supports up to 330 lbs., the highest weight in its class. It is also EASY TO OPERATE with a simple joystick design. It can be operated with either hand, and is now even easier to fold/unfold with a simple click of a button. THE BEST-IN-CLASS COMPONENTS make it quiet and reliable, requiring virtually no maintenance. It is powered by two certified Lithium-Ion batteries, providing a 12.5-mile range, and the highest energy density-to-weight ratio. The device is run by two brushless motors, commonly used in robotic applications. They are not only powerful, but quiet to operate and long-lasting, and have the highest weight-to-power-output ratio. EXTENDED WARRANTY to give you complete satisfaction and peace of mind. To protect your investment, we have included a 5-year warranty on the device and 6-month warranty on the battery. Feel free to reach out to us with any questions. We are here to serve you. Lightweight! It is just 80 lbs with Lead Acid batteries! 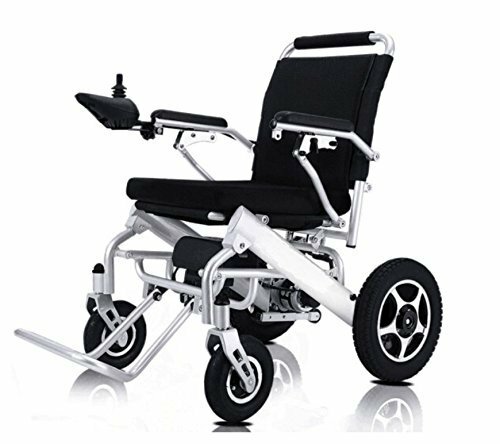 The versatile wheelchair is assembled with Sprayed Steel Foldable chair, 12V 12A * 2pcs Lead Acid batteries, breathable seat and back cushions. Apply to all different road types such as grass, ramp, deceleration strip, brick, muddy, snow, bumpy road 24V 250W * 2pcs Motor, Max 4 mph, Range: 13 Miles, Charging Time: 8 hours. Front Wheels: 8 inches, Back Wheels: 16 inches. Seat: 17x16x21 inches. Wheelchairs weight is 60 lb, batteries weight: 30 lb, Total 90 lb. The weight capacity is 260 lbs. The tires are solid & inflatable, wear resisting. The front driven wheel is 8 that could rotate 360 degrees which makes it easy for turning. Innuovo presents the MOST MANAGEABLE & CONVENIENT Electric-powered wheelchair on the market today. The Innuovo Electric Powered Wheelchair Model W5521 is designed to be straightforward. To fold it, all you need to do is release the lock and push to collapse the chair. This way, it will easily fit in your car, even in the trunk of a regular Sedan! We are proud to offer the very best-in-class safety features. The front and back wheels are made of solid rubber, making it virtually impossible to get a flat tire. Electric braking allows the user to come to a full stop within a 3-foot range. The wheelchair is FDA certified, making it safe to travel by air with your wheelchair. The W5521 is built with more powerful motors than previous generations, meaning it can go faster. It also has larger back tires and is more robust. This makes it more stable than ever, which is why it's ideal for using both indoors and outdoors. Other important features are: The electric controller (joystick), which can be placed on either armrest for right or left-handed people. One battery is included. Additional batteries are sold separately. THE SAFEST AND MOST STABLE electric wheelchair available on the market today. 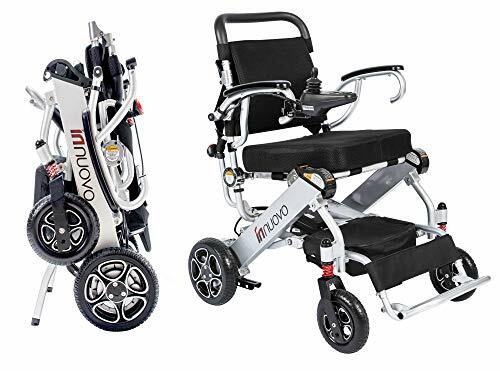 The INNUOVO Electric Powered Wheelchair is FDA approved and can be used for air travel. IDEAL FOR OUTDOORS. With its big and robust frame, this wheelchair is perfect for using outside. Go on errands, visit neighbors and enjoy the fresh air on your own. EASIER, QUICKER FOLDING in just 2 seconds. Release the lock and press on the chair to collapse it. No need to adjust the armrests or remove the cushion. It is a portable and convenient device that easily fits in the trunk of your car when folder. The entire device, including the battery, weighs less than 68 lb. EASY TO OPERATE with a simple joystick design, made to be operated with one hand. The controller can be attached on the right or left-hand side of the wheelchair armrest, so that it is comfortable for both right or left-handed users. AN EXTENDED WARRANTY to give you complete satisfaction and peace of mind. To protect your investment, we have included a 5-year warranty on the device and 6-month warranty on the battery. Feel free to reach out to us with any questions. We are here to serve you. The TravelScoot is for those who find it difficult to walk due to fatigue but are not fully disabled. Famous for fitting into any car due to its compact, portable nature, people will stop you to ask what it is. Price includes the frame, canvas basket, manual bell, toolkit, seat spacers, 274 Wh FAA approved lithium-ion battery, battery charger, and combo cable lock. All of this comes shipped inside a large duffel storage bag. The battery goes 12 miles per charge with an average lifespan of 4-6 years. A 2-year manufacturer warranty included for the battery and scooter against manufacturer defects for greater peace of mind. The TravelScoot comes equipped with two highly effective mechanical band brakes which require a modest amount of hand strength to operate. It features a throttle delay which smoothly brings the user to top speed (4.5 mph). The TravelScoot can easily take on inclines of 15% and is equipped with rear-wheel drive which is designed for better climbing and superior traction while traveling. Suitable for riders 5' to 6'6 in height. Jr. size also available. Amazon's lightest mobility scooter at 34 pounds (24 lb frame, 6 lb. seat, 4 lb. battery), features a smooth throttle delay w/ a top speed of 4.5 mph and can easily take on inclines of 15%. The TravelScoot is equipped with rear-wheel drive which is superior to front-wheel drive for climbing and traction on uneven terrain. Since its inception in 2004, the TravelScoot mobility scooter has helped thousands of individuals regain their independence. It was, and still is today, the lightest and strongest electric mobility scooter in the world. Although many companies have tried to copy its compact, tri-fold design, all have failed. The TravelScoot can fit into the most compact car imaginable. It can be broken down in mere seconds by releasing two clamps and locking pins. TravelScoot's patented triangular design provides our customers with unprecedented strength for an ultra lightweight ride. The frame is constructed from aircraft grade aluminum and is rust-resistant. 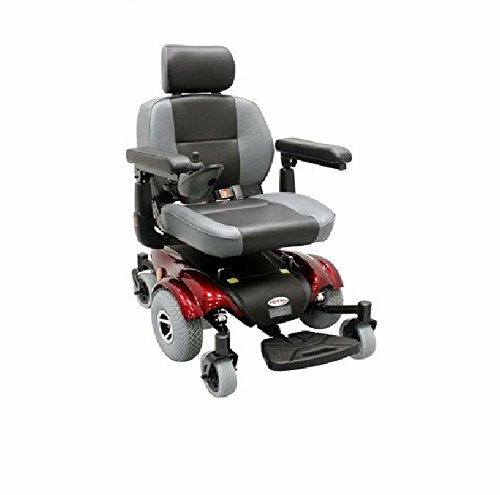 It includes a forward and reverse power switch, twist-grip throttle with built-in delay for safety, dual manual band brakes (left and right), built-in hub motor (inside rear-left wheel), height-adjustable backrest & solid tires. Great on hard-packed surfaces. Each TravelScoot has an adjustable steering column, adjustable seat (up and down, left and right swivel), and adjustable backrest for the perfect comfort level. 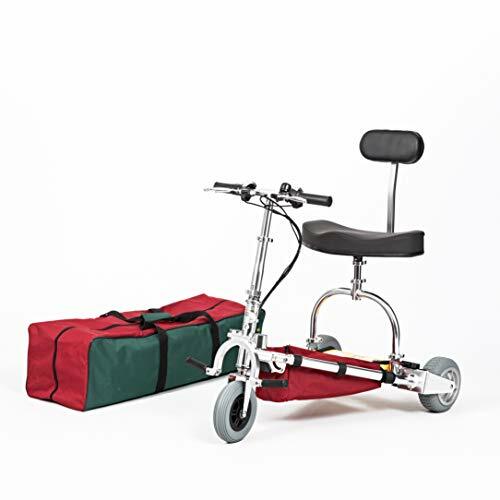 The TravelScoot includes the frame, canvas basket, manual bell, toolkit, seat spacers, 274 Wh FAA approved lithium-ion battery, battery charger, combo cable lock, and adjustable backrest for one-handed carry. All of this comes shipped inside a large duffel storage bag. The battery goes 12 miles per charge (or more) with an average lifespan of 4-6 years. The scooter comes with a 2-year warranty for riders 340 lbs and under, against manufacturer defects for greater peace of mind. 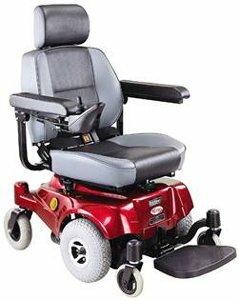 HS-2850-BURG Color: Burgundy Features: -Upgraded compact mid - wheel power chair. -Material: Metal / Plastic. -Brake: Electro - mechanical. -Seat type: Mid - back seat with adjustable headrest and seat belt. Frame Color: -Color. Top Speed: -4.2 Miles Per Hour. Maximum Weight Capacity: -300 Pounds. Generic Specifications: -Motor size: 420W 4900 rpm. -Battery size: (2) 12V . 36Ah. Generic Dimensions: -Battery weight: 53 lbs. -Seat width: 19''. -Overall dimensions: 42.5'' H x 24'' W x 39'' D, 108.8 lbs. Dimensions: Overall Height - Floor to Top of Chair: -42.5 Inches. Overall Width - Side to Side: -24 Inches. Overall Depth - Front to Back: -39 Inches. Seat Width - Side to Side: -19 Inches. Overall Product Weight: -108.8 Pounds. Brand: CTM Homecare Product, Inc. | Manufacturer: CTM Homecare Product, Inc. Pride Mobility has always been known for their excellent full-sized power wheelchairs and great travel-sized scooters. Now you can have the terrific features of both in the All New Go-Chair. With an easy-to-remove battery pack and lightweight frame, the Go-Chair is a great choice to get you going. The all-new Go-Chair is re-engineered from the ground up, offering a sleek, bold new style available in an array of contemporary colors. Enhanced performance and comfort, along with feather-touch disassembly, allows you to enjoy light-weight travel and independence on the go. With an increased weight capacity of 300 lbs. and a sleek, bold look, the new Go-Chair makes travel easy. Experience the Next Generation of Lightweight and Fold-able Mobility Aids -- a Beautifully designed and extremely well crafted frame for comfortable riding supporting users up to 330 pounds. We took our regular Deluxe Model and widened the distance between the arm rests over 2 inches, which provides added comfort for heavier users. The WX12 Model is equipped with 7.5" Front Wheels and 12" Rear Wheels. It has the Quickest & Easiest Folding and Unfolding action ever. It literally will unfold in one second. The Back Support Reclines in 5 positions, for maximum comfort. Weighs Only 62 Pounds & Carries Passengers up to 330 Pounds. 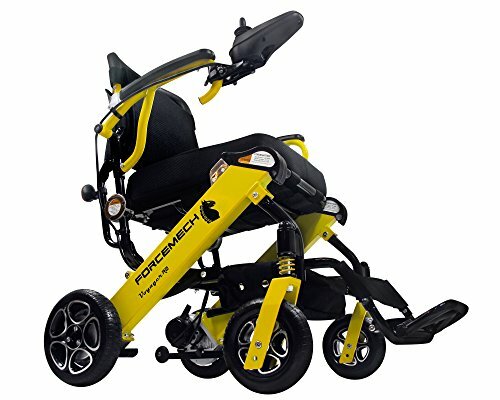 The Folding Cirrus Plus EC 22" Power Chair by Drive Medical is foldable and lightweight making it ideal for transporting. It comes in an attractive, lightweight, carbon steel frame with a silver vein finish which is easy to maintain. This model has a double cross brace frame to support an increased weight capacity. 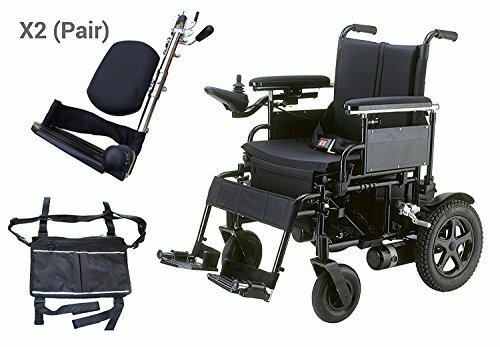 This Power Chair comes standard with a seat belt, seat cushion with pouch for easy storage, swing away footrests with calf straps and heel loops, wheel locks and an adjustable tension, padded, back upholstery, adding to users convenience, safety and comfort. The integrated, programmable PG controller and adjustable length joystick mount accommodates most user sizes. The Cirrus Plus EC Folding Power Chair has been tested and surpassed the ANSI RESNA testing requirements, providing our consumers with added security. - Seat Width: 16", 18", 20", 22"
- Seat to Floor Height: 18.5"
- Seat to Foot Deck: 14"
SPECIAL OFFER : OPC / OutstandingProductsCo. Offering Now FREE OPC (TM) Black Medical Utility Bag with this Wheelchair Purchase. This item is new, unused and sold Manufacturer Direct in the Items Sealed Retail Packaging. This Item Carries an AUTHENTIC Manufacturer's Warranty as We are an Authorized Re-Seller of the Manufacturer. Elevating Leg Rests, Foldable, Lightweight Frame For Easy Portability . Steel Double Cross-brace Frame . Adjustable-tension Back Upholstery . Armrests Are Padded, Adjustable, And Removable . 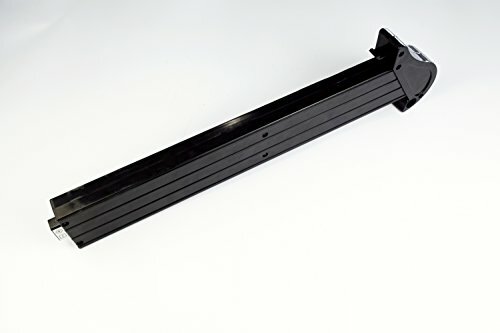 Adjustable-length Controller Mount . Swing-away Footrests With Heel Loops . Positioning Belt Included . Padded Back Upholstery With Storage Pouch And Cushioned Seat . Programmable Controller . Flat-free, Non-marking Tires . Easy Freewheel Operation .